Account tags allow you to segment your membership within and across account types. An example use case is clubs that offer a discount for members who volunteer at a pool clean up day. 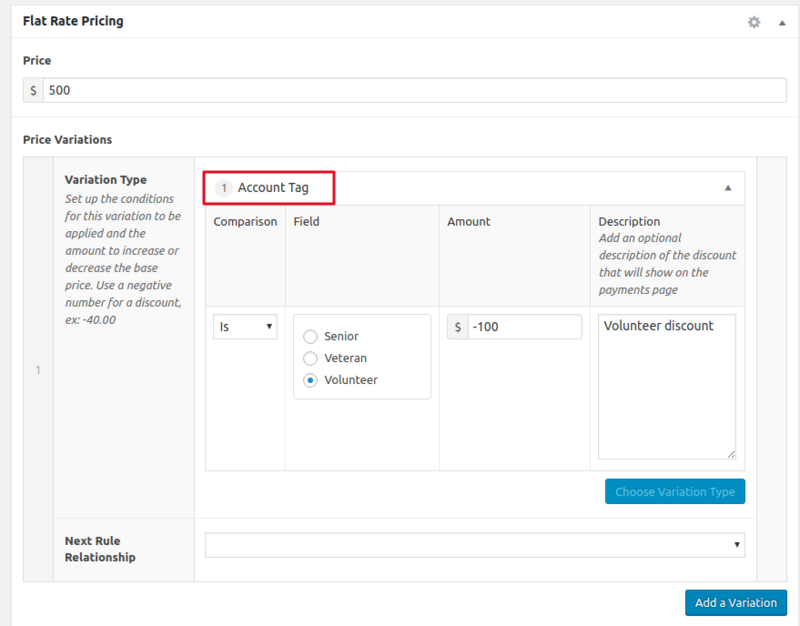 With account tags you can mark those accounts as “Volunteer” and then create a discount for them based on the tag, regardless of account type. You can apply as many account tags as you like to an account and you can create complex pricing rules based on them. To add new account tags and manage any existing ones go to Members -> Account Tags. On this screen you can view your existing tags; see how many accounts each tag is currently applied to; and create new tags. You can also delete existing tags by hovering over the name of the tag in the table on the right and then hitting delete but be careful when doing so — deleting a tag is permanent and will remove it from all accounts. 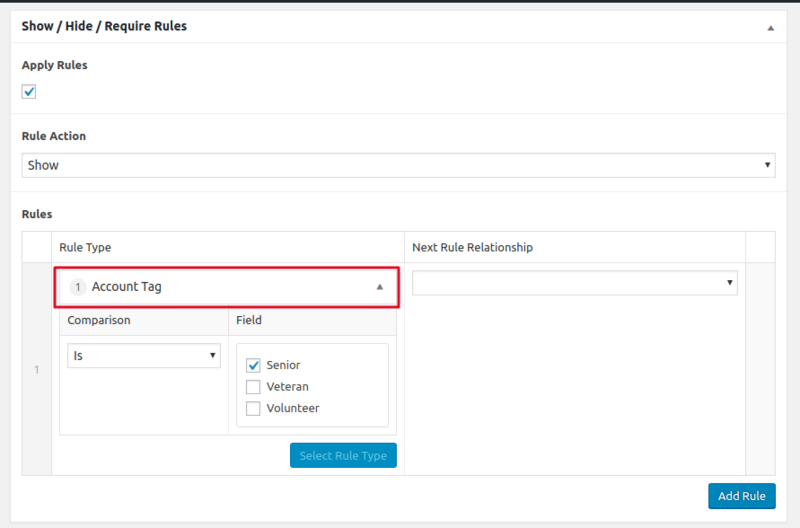 Even if you re-create the tag you will need to reapply it to each account and update any product discounts that depended on it as the new tag will have a different term id in the database. Ex: In the screenshot above tag ID 122 is Senior. If you delete that tag and then add a new tag also called Senior it will have a different tag ID. Any rules based on the old ID will need to be updated. All of the available account tags are visible on the edit account screen. Important: Account tags are not visible to members. They are meant strictly for admin use. 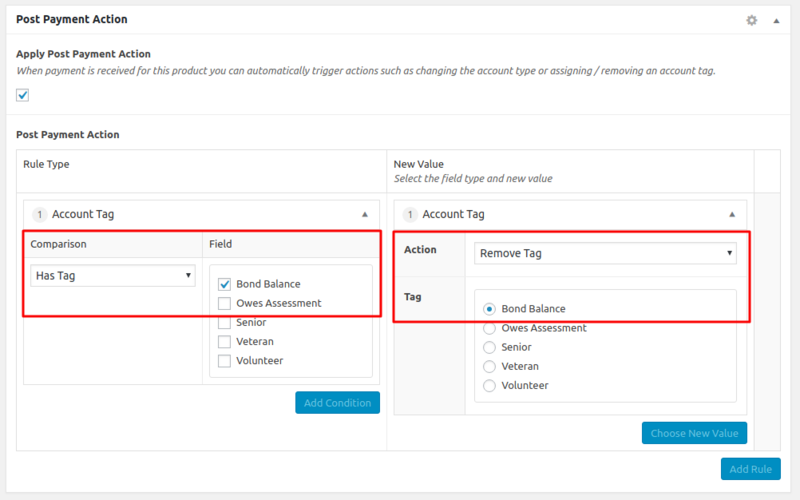 To add or remove a tag from an account simply check the box next to it and then submit the changes. For products that have a fixed price you can apply a discount based on an account having a specific account tag. You can also combine discounts so it is possible to do something like a $100 discount for volunteers OR veterans and a $50 discount for seniors. 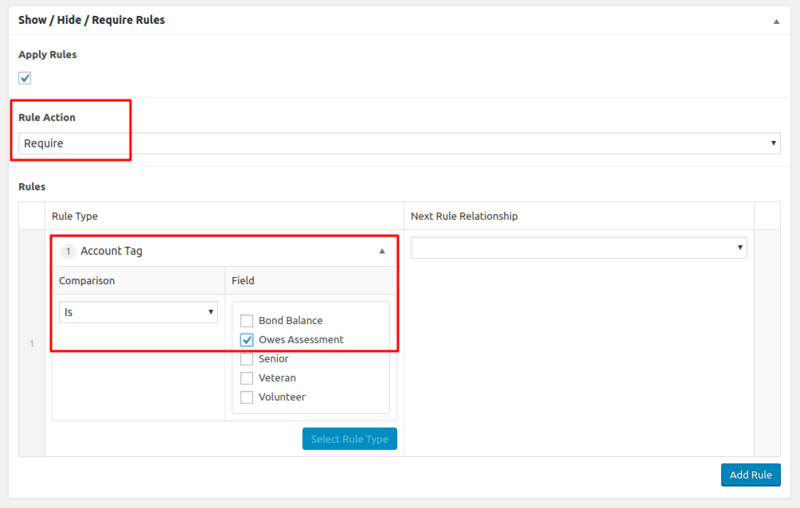 Products in Member Splash can be conditionally displayed or required based on various criteria. For example, you could require all accounts with the account type “New Member” to pay a bond fee. The show / hide / require rules can also be based on account tags. In this example we’re showing a product only to accounts that have the account tag Senior. Post Payment Rules are just what they sound like — actions that can be triggered when payment is received for something. An example would be a rule that changes an account type from Offered Membership to Bond Holder when someone pays a bond fee. NOTE: These rules are triggered when payment is received, not when the order is placed. If payment is by check the rules won’t be triggered until receipt of the check is recorded.